Nearly every Chinese family in China and all over the world has their own method and secret recipe for Hong Shao Rou. Vietnamese and Thai also have very similar method of cooking pork. This stewed pork is the ultimate comfort food. Hong Shao Rou should always use belly pork with skin which is stewed till very soft and tender. *Blanch the pork pieces for about 1 min in boiling water. Wash away any impurities on the meat. Mix the pork pieces with the marinade mix, and leave for few hours - overnight. **Put few tbsp of oil in a wok add sugar and heat till caramelised. Add chopped garlic, star anise, crushed pepper and cinnamon. Stir till fragrant and without burning the caramel. Add the pork pieces without the excess marinate. Stir fry till the meat juices has dried up. Add a splash of cooking wine and the remaining marinate. Add enough water (just over 1 cup) to cover meat. Bring to a boil, cover and simmer for around 1 hour till the meat is tender and the sauce has reduced. Taste and see if you need more soy sauce. There may be quite a bit of fat floating on the sauce, skimmed if you want to. This oil is very fragrant and nice to stir fry green vegetable like pak choi to go with the pork. *Blanching the pork give a clearer sauce with less impurities. 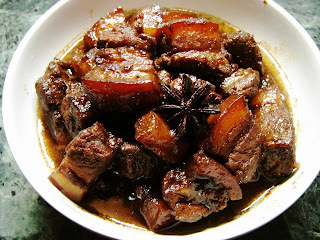 **caramelised sugar give the pork a brownish red colour. 1 -2 dried or fresh chilli can be added for a spicy taste. Many people like to add shelled hard boiled egg to be stewed with the pork. Sorry for the late reply, for this recipe I only used normal black peppercorns. You can add Sichuan peppercorns if you like. I've followed your recipe twice already... amazing results! thanks so much for a delicious hearty recipe!